What a difference a week makes - after staying nearly a week at Alcoutim, partly because of a May Day celebration involving sardines & wine but mainly because of more unsettled weather, we have since been basking in glorious weather, with temperatures up to 34° C. Whilst at Alcoutim, we met a chap who keeps his yacht on a mooring just a little upstream, but who lives in Castle Combe. So we had an in-depth discussion about country pubs in that area, including the Vine Tree at Norton and, of course, my last local in the UK, the Old Royal Ship at Luckington. Small world, init? View from Alcoutim Castle across the river to Sanlucar. De what? The 'Riversi' had folded up. 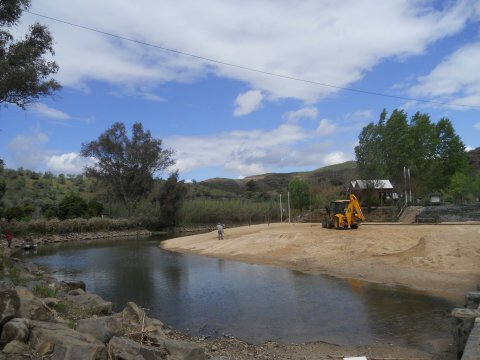 The blue flag beach at Alcoutim having more sand added. 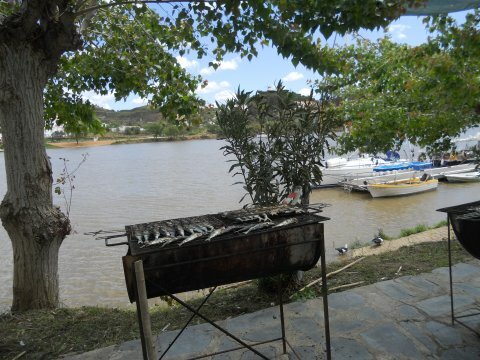 "Perhaps we'll stay here today..."
On Thursday 3rd we had a less than pleasant trip back down the Guadiana to Ayamonte. 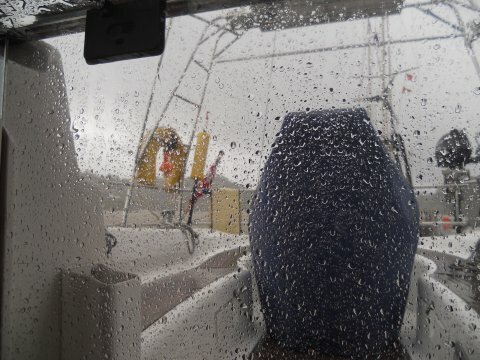 After leaving Alcoutim in fairly benign conditions, we were soon heading south with the tide into a F6 wind as we wanted to arrive at the suspension bridge near low water. 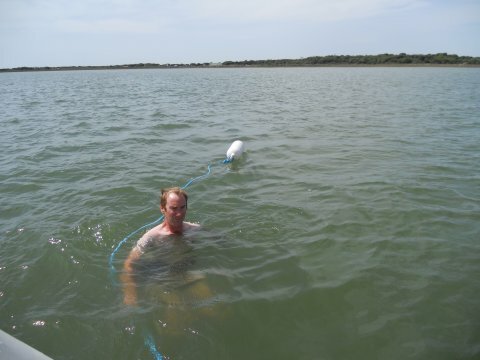 As the river widened at the lower reaches there was quite a chop as we had wind against tide, so after nearly 4 hours we were glad to secure to our previous pontoon finger in Ayamonte marina. 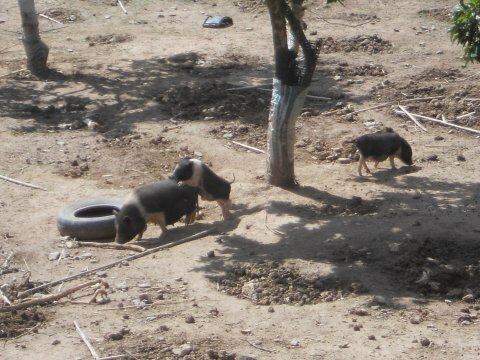 We stayed at Ayamonte for 3 nights, stocking up a bit, buying gas, buying a few bits & pieces in Ayamar and trying to get the Vodafone broadband dongle to work (there is enough material for an update all of its own regarding the latter...). We visited the produce market, which had the most impressive fish & crustacean stalls we've seen in a long time. We bought some clams and they turned out to be the best we've ever had - either that or the way we cook them has improved! On Sunday morning we crept out a little after low water (the echo sounder resolutely stuck to 0 as we passed 2 hammerheads even though we had clearly been afloat at low water and had confirmed our offset with the hand-held echo sounder) as we wanted to arrive at El Rompido about an hour before high water. There is a long sand spit that has to be negotiated, and the channel buoys are regularly moved as the sand shifts. 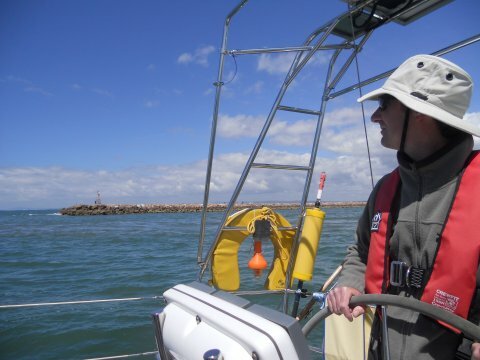 The first buoy (safe water mark) was some distance from where we were expecting and red only instead of red & white, but we found it easily enough in perfect visibility, and then followed the buoyed channel for about 4 miles to the marina. We anchored just beyond the marina, even though it was quite windy. 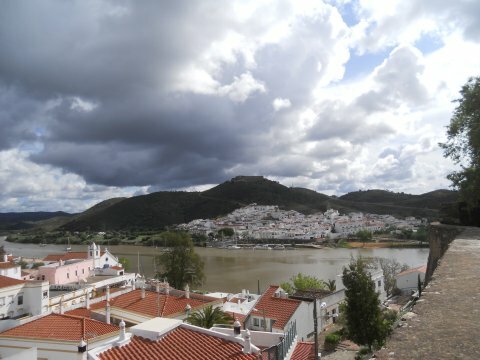 Our last view of Portugal. The following morning we moved in to the marina as we had a number of jobs we wanted to do - thoroughly washing Pipit prior to polishing the coachroof, adding some fittings to the dinghy, more aggravation with the Vodafone dongle, a mountain of washing and a few other odds & ends. The marina is unusual in its design in that there is a single wide pontoon (a pier really) which connects to the finger pontoons out in the river. It's all fairly new and really quite attractive, and the staff were friendly and helpful. An added bonus is that it was surprisingly cheap too! 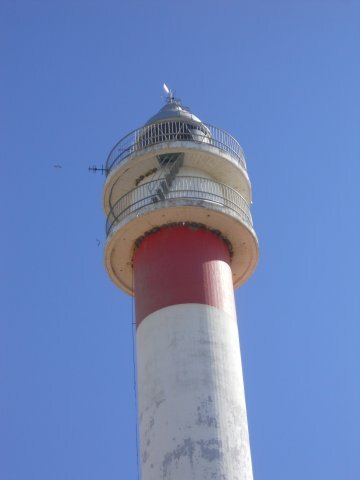 House Martins nesting on El Rompido lighthouse. 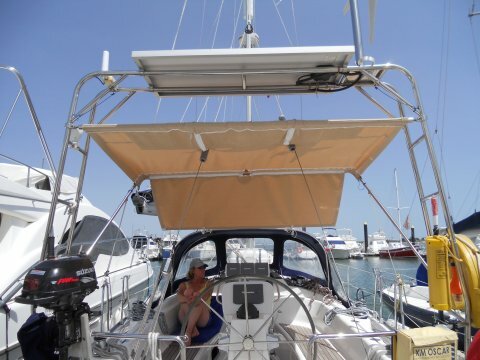 Bimini & 'sunroof' working well. Just a couple of minutes walk away from the marina is a small supermarket and a few other shops & bars which serve the adjacent golf resort as well as the marina. We had a pleasant if rather too hot circular walk alongside the river & golf course and ate out in the town itself one night. There is also a very well stocked chandlery near the marina (part of the French Accastillage Diffusion group) where we could have bought a Foker and a Yamashit - no idea what they were but we restricted ourselves to a few stainless nuts & bolts, plastic cleats & Sikaflex for the dinghy. After 5 nights we returned to anchor in absolutely ideal conditions - a light cooling breeze by day, nothing at night so no wind over tide issues for a change! We also had cooling swims from Pipit for the first time this year - water temp 27° C - although we trailed a line as there was up to 3 knots of current running at times. 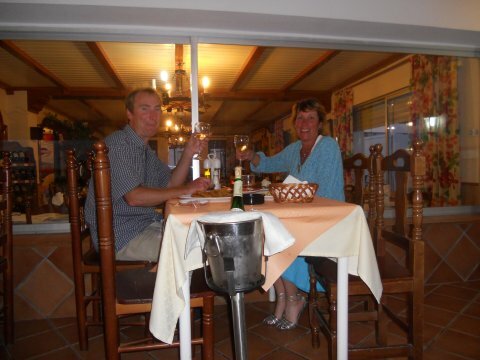 Dining out in El Rompido. 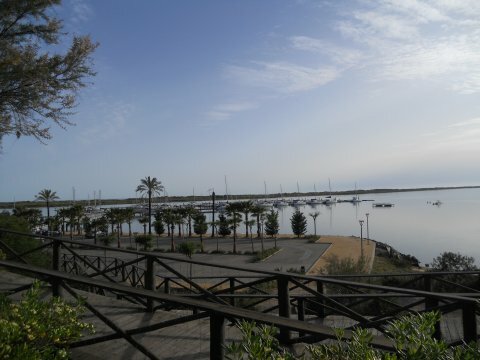 View from the bar above El Rompido marina. Unfortunately it doesn't show the 'pier' out to the pontoons. Not as crystal clear as the Med, but refreshingly cool. 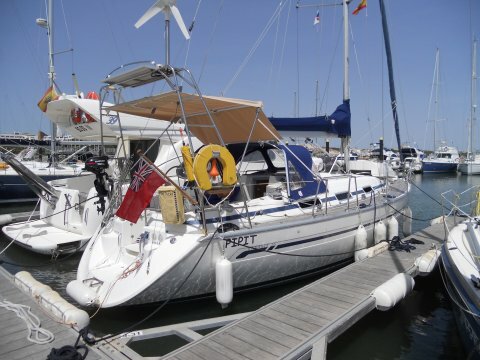 We really rather liked El Rompido, a nice marina and a peaceful anchorage just beyond, with abundant bird life to watch (and it's only a matter of time before a leaping fish mistakenly leaps onto our sugar scoop!) but it was time to move on so, late on Monday morning in still conditions, we weighed anchor to motor down the river and negotiate the sand spit once more. But within a hundred yards, what's this, 10 knots on the beam? We can sail out! And so we did, past the many thousands of (mainly) power boats moored on buoys and past a new marina that is being built, and then onto the buoyed dogleg around the spit, despite a service boat towing one of the greens away as we sailed past! We did have the engine running for this bit just in case... The safe water mark had also been painted during our stay and we can report that it is now the regulation red & white again! Even though it was near high water, we had less than 2 metres below us, so we wouldn't have been able to get out (or in) at low water. You can just see the sand spit below the boom - this aerial photo shows it much more clearly. On Tuesday, despite little wind being forecast, we moved on to Chipiona, as south-easterly winds were forecast for the following few days. As predicted we motored all the way, but the sun was out, it was warm and the sea was flat, so it wasn't exactly unpleasant. 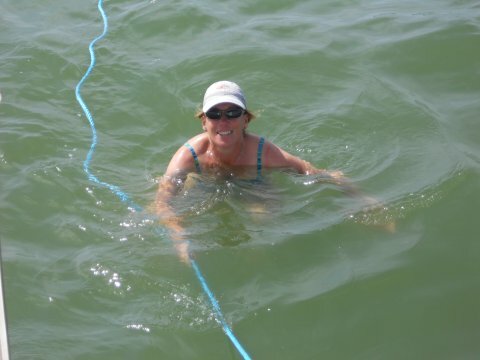 We anchored outside of the marina (we seem to keep anchoring where there is nobody else - a little disconcerting, does everyone else know something we don't?) and had a calm night, having spent the evening watching the comings & goings of the numerous small fishing boats and the pilot boats delivering pilots to the ships anchored in the bay prior to them navigating up the river to Seville. 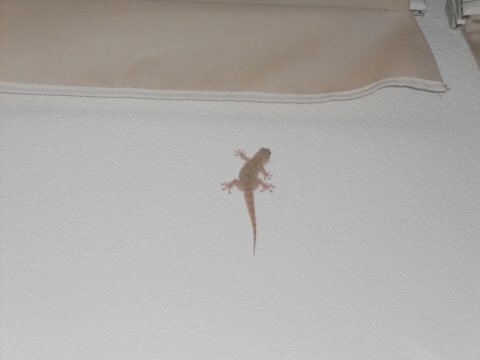 The next morning we moved into the marina to attend to domestic chores. Amongst other things, we got the Vodafone problem sorted - by buying an Orange dongle & SIM. This worked, like Vodafone Portugal, exactly as one would expect - remove from packaging, plug in, and away you go. We've not given up on Vodafone Spain totally, but it's been incredibly frustrating to have paid for something that doesn't work - and we are not alone, judging by postings on the web, as other people have had a similar problem that has gone unfixed. All the more disappointing as my last but one contract was with Thales, who used to be Racal, from which Vodafone (voice data fone) was spun off. Whilst there I worked with a seasoned and talented old engineer who way-back-when chose not to move to Vodafone - couldn't see a future in it... But as we now know, the future's Orange, and they used to be owned by BAe, who sponsored me and gave me my first graduate job, so that's fine. History lesson over! Having decided against taking Pipit up the Guadalquivir river to Seville (it's over 50 miles and described in the pilot book as 'tedious') on Thursday afternoon we set off once more into town to buy some fish for dinner and returned with a pair of castors and two pairs of slippers instead - well these things happen... The castors are for the passerelle, and the slippers are actually fake Crocs. 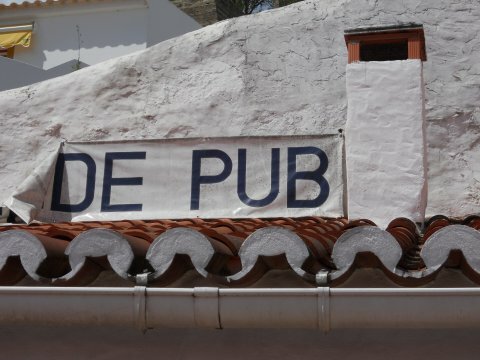 There were supposed to be 3 chandlers in Chipiona, but they all appeared to be closed down. 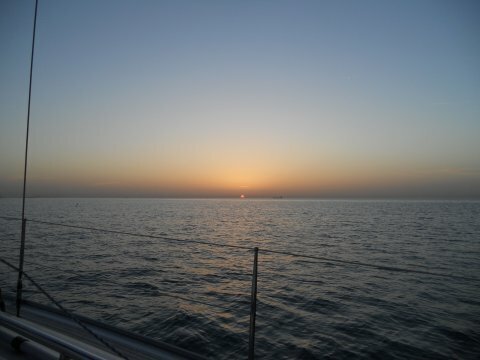 And so on Friday morning, we set off towards the Bay of Cadiz, leaving the final decision of where to go until we were in the bay. 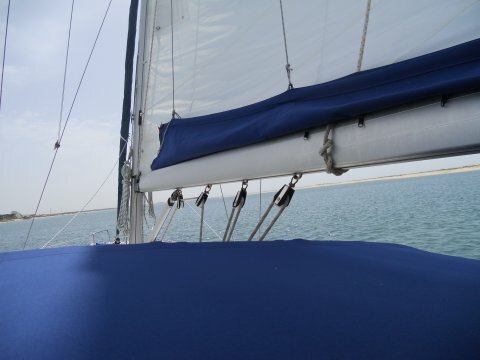 The sea state was the highest we've sailed in this year, and we had one reef in the mainsail with a partly furled genoa, but we made good progress in the fresh south-westerly breeze. As the anchorage we had identified was exposed to the south-west, we decided to head for Rota marina, from where this update has been despatched. This turned out to be a wise decision as we are now experiencing very strong westerly winds & rain squalls, with thunder forecast for tomorrow. so we'll linger here a while whilst planning our next passage towards Gibraltar - possibly only two hops away now. We'll also investigate excursions to Seville, Cadiz or El Puerto de Santa Maria. Finally, please take a look at our Voyage Map - we use our waypoints mainly but add points from Google Earth where necessary, for example up the Guadiana and El Rompido, and this takes ages - thank you!